Present Perfect Tense is used to express unfinished events that started in the past and continue to the present. The events are still continuing. 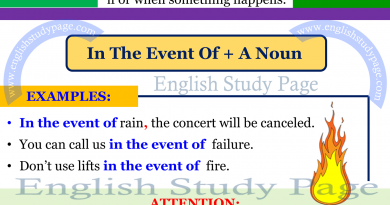 Simple Past Tense is used to express finished events. We can’t reach Paul by phone. Have you seen him? Tom isn’t at school. I think he has gone to the theater. 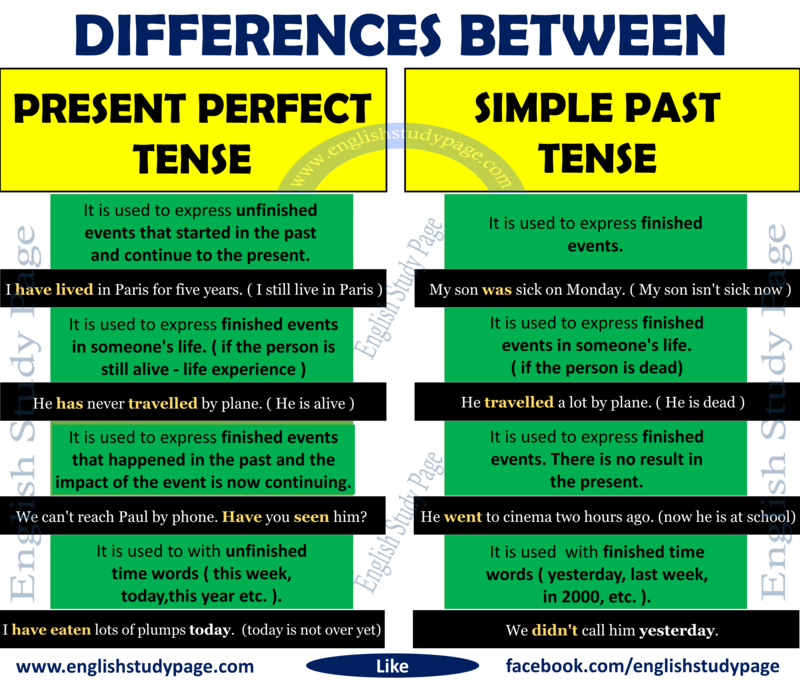 Simple Past Tense is used to express finished events. There is no result in the present. Present Perfect Tense is used with unfinished time words ( this week, today,this year etc. ). The period of time is still continuing. 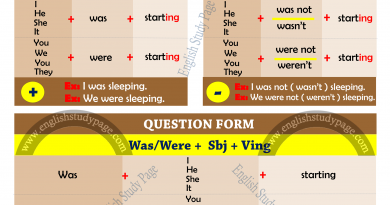 Simple Past Tense is used with finished time words ( yesterday, last week, in 2000, etc. ). We didn’t call him yesterday. I ate lots of plumps last week. They had several exams last year. If we use a specific time in a sentence, we should use “Simple Past Tense“. 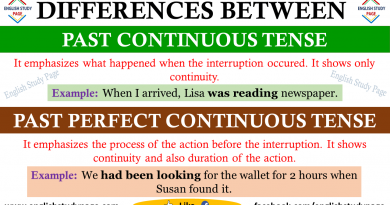 If we use an unspecific time in a sentence, we should use “Present Perfect Tense“. Time words with “in the” and without “in the” have different meanings. “Last month” and “in the last month” have different meanings. “Last month” means the month before now. It is considered a specific time, so it requires Simple Past Tense. “In the last month” means from 30 days ago until now ( at some point between 30 days ago and now ) . It is not considered a specific time, so it requires Present Perfect Tense. We haven’t received any mail in the last month. We didn’t receive any mail last month. I have solved many problems in the last year. I solved many problems last year. Copyright © 2019 English Study Page. All rights reserved.